One of the most intriguing inquiries into the literature of the Old Testament has to do with that mysterious being that is referred to as “the angel of Jehovah” (KJV; Gen. 16:7-14) or “the angel of God” (Gen. 21:17-19). The two expressions have to do with the same entity (cf. Judg. 6:20, 21). Exactly who was this person? One of the first issues that must be addressed is the significance of the term “angel.” The Hebrew word is malak and it “simply signifies a messenger” (Girdlestone 1973, 41). The nature of the messenger must be determined by the context. It could be a messenger of a heavenly order — an angel as we ordinarily think of that term (Gen. 32:1). Or it may denote a human messenger operating on behalf of someone else, as in the case of Jacob’s emissaries (Gen. 32:3). On the other hand, the “angel [better rendered ‘messenger’] of Jehovah” stands in a class by himself. The “messenger of Jehovah” himself possessed characteristics that can only be ascribed to deity. Yet this being is distinguished from another person who is also designated as Jehovah. The messenger of Jehovah is to be identified with the pre-incarnate Word, Jesus Christ. Let us address each of these propositions. He promises to multiply Hagar’s seed, and she confesses, “You are a God who sees” (Gen. 16:10, 13). The messenger called unto Abraham, saying, “By myself I have sworn, says Jehovah” (Gen. 22:15, 16). He said to Jacob, “I am the God of Bethel” (Gen. 31:11, 13). It was this messenger who wrestled with Jacob (cf. “angel” in Hos. 12:4) at Peniel, and yet the sacred text identifies this person as God (Gen. 32:28-30; Hos. 12:3-5). 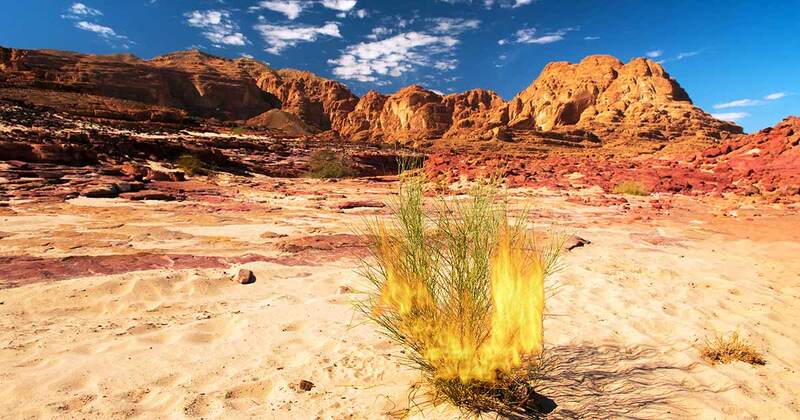 This messenger spoke to Moses from the burning bush, referring to himself as God (Ex. 3:2ff). The messenger attributed to himself the divine oath (Judg. 2:1-3). This “prince of Jehovah” accepted worship and spoke as God (Josh. 5:13-6:2; cf. Judg. 6:19-27). Ordinary angels refuse worship (Rev. 22:8, 9), but a number of Old Testament worthies called this person “God” and the designation was never repudiated (cf. Gen. 16:7ff; 22:11, 14; 48:15ff; Judg. 13:21, 22; Zech. 3:1ff). There is, therefore, a vast amount of evidence leading to the conclusion that the messenger of Jehovah was a divine being. In spite of the fact that the holy messenger is endowed with the traits of deity, he is also distinguished from Jehovah. Repeatedly, he is designated as the “messenger of Jehovah.” He is Jehovah himself and he is acting on behalf of another who is also Jehovah. In Exodus 23:20ff, Jehovah promised the children of Israel that he would send an angel (i.e. messenger) before them as they sojourned in the wilderness of Sinai. This messenger would keep them safe and bring them finally to Canaan. The Hebrews were warned to listen to his voice and not provoke him. Otherwise, he would not forgive their transgressions. It would be appropriate at this point to anticipate a question that many sincere students doubtless have. Namely, how can this being be both Jehovah and yet be a messenger from Jehovah? Is the designation “Jehovah” applied to more than one divine person? The answer is yes. The name Jehovah (Yahweh) is derived from a root form, havah, which means “to be” or “being.” It suggests that deity is absolutely self-existent (Stone 1944, 15). It thus is a fitting appellation for each of the persons within the holy trinity since each of these is characterized by uninitiated existence. We are not surprised, therefore, to see references to more than one person who is designated as Jehovah, sometimes in the same passage. Isaiah declared: “Thus saith Jehovah, the King of Israel, and his Redeemer, Jehovah of hosts” (Isa. 44:6). Note that expression, “messenger of the covenant.” The ancient Jews held this passage to be a reference to the coming Messiah (Henderson 1980, 457). The New Testament, of course, makes that point quite clear. And so, conservative Bible scholars are fairly well agreed that the angel of Jehovah, or the messenger of the covenant, so prominent in the Hebrew Scriptures, was the Lord Jesus himself in his pre-incarnate state. “The statement ‘the rock was Christ’ signifies that it was typical of Christ; but there is more than this, for the Apostle does not say that the rock is Christ, using the present tense as in Gal. 4:24-25 concerning Sarah and Hagar, as representing two covenants, and as in the parables in Matt. 13:19-23 and 37-38. The past tense ‘was’ implies that the water was provided by the personal presence of Christ; for the Angel [Messenger] of His presence was with the Israelites through all their wilderness journeyings (Isa. 63:9)” (131-132). No study of Christ, therefore, can afford to overlook the angel of Jehovah in the Old Testament. Such was a preview of the approaching Messenger from God. Cole, Alan. 1973. Exodus — The Tyndal Old Testament Commentaries. D. J. Wiseman, ed. Downer’s Grove, IL: Inter-Varsity. Girdlestone, Robert. 1973. Synonyms of the Old Testament. Grand Rapids, MI: Eerdmans. Henderson, Ebenezer. 1980. The Twelve Minor Prophets. Grand Rapids, MI: Baker Book House. Stone, Nathan. 1944. Names of God. Chicago, IL: Moody Press. Vine, W.E. 1951. 1 Corinthians. Grand Rapids, MI: Zondervan.